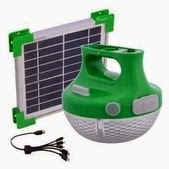 Schneider Electric Solar-powered portable LED Lamps with mobile charger NOW AVAILABLE in Myanmar! rural environments. The lamp is equipped with mobile phone charger with USB port enabling users to charge mobile phone any time. It features 3 brightness settings providing up to 48 hours of lighting with one day of solar charge. The 7 simple usage allows the lamp to hand carry, hook to the ceiling, mount on the wall, place on the desk, fix on the bottle top and carry on a pole. The patented design has won Grand Prix, Strategies Du Design 2013 and European Design awards. Its superior battery technology - Lithium Ferro Phosphate battery delivers high performance for more than 3 years. The micro-controller based charge controller ensures efficient solar charging, prevents over charge and deep discharge. Smart electronics for battery monitoring shows indications for battery charging, battery charge level remaining and recharging when drained. TS 120S has its own solar panel. TS 120 is a portable lamp without solar panel. It can be used with any 12 Volt solar home system, where in it is charged through 12V charge controller. It can also be used in Schneider Electrics' battery charging station.